In 2014, there were 551 bike crashes in Philadelphia alone. In addition to injuries and fatalities, it has cost the US taxpayers several billions of dollars a year ($109 billions in economic costs and societal harm). This is not to say bikers are the problem, but rather they are not receiving enough help from the 21st century’s technology to keep up with the ever-increasing number of distractions on the road (i.e., motor vehicles and pedestrians). It is extremely risky for bikers to look back for incoming cars while focusing on the road in front of them. 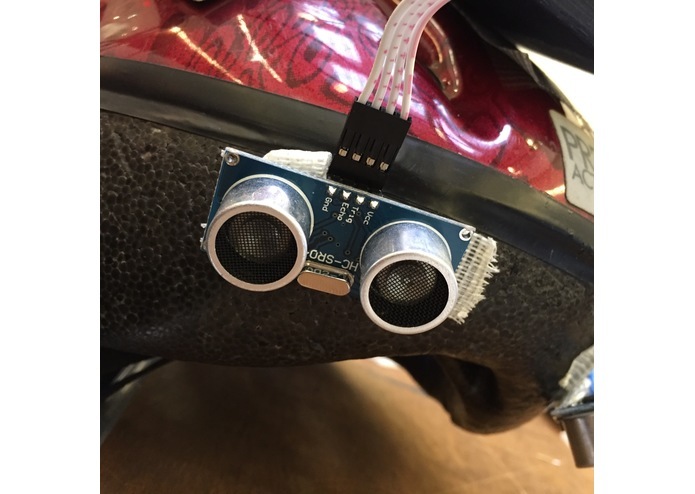 We decided to build a device that essentially gives them one pair of virtual eyes that are strategically placed, so that they are aware of their 360° at all time. 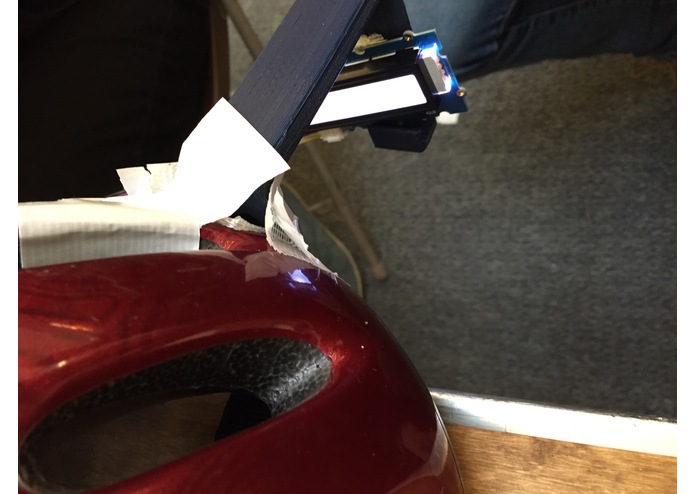 The safety of the bikers is our main concern, and therefore, regardless of the number of assistances we installed, the lack of additional distractions resulting from the device is one of our main considerations in the hack. The 360° S&G Jalapeño Helmet is a safety and guidance system that provides uncompromising assistance to bikers. 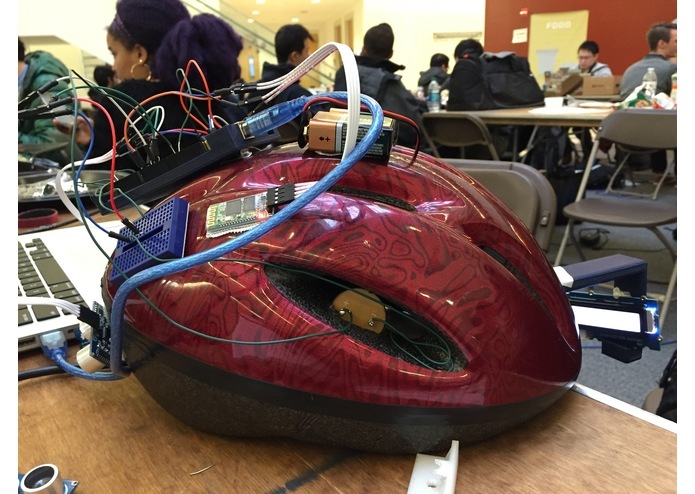 The main task is to alert the biker of surrounding objects, such as cars, and where they are—relative to the biker via two buzzers placed inside of each side and two ultrasonic sensors placed on the two rear sides. The right or left buzzer will sound if the respective side of the ultrasonic sensor detects objects closing in fast. Both will sound if both ultrasonic sensors get a similar reading, indicating that an object is coming in close right behind. It won’t simply alert the biker when an object is close the biker, but alert the individual depending on how fast the object is approaching the biker. This is a critical part of the process due to many complications that are inherent in nature. Additionally, the S&G system will also guide the biker on where and when to turn to get to a specified place via the integrated LCD display with the help of Google Maps turn-by-turn navigation and assistance of our Android app. All mentioned components will be connected to the Arduino Mega, which connects to an Android app via the attached bluetooth module on the Arduino. The app uses the smartphone’s Global Positioning System and sends a string to the LCD display that guides the direction of the biker. To better mount these components onto a helmet, we designed custom 3D parts that would make reliable connections for both the helmet and the components. 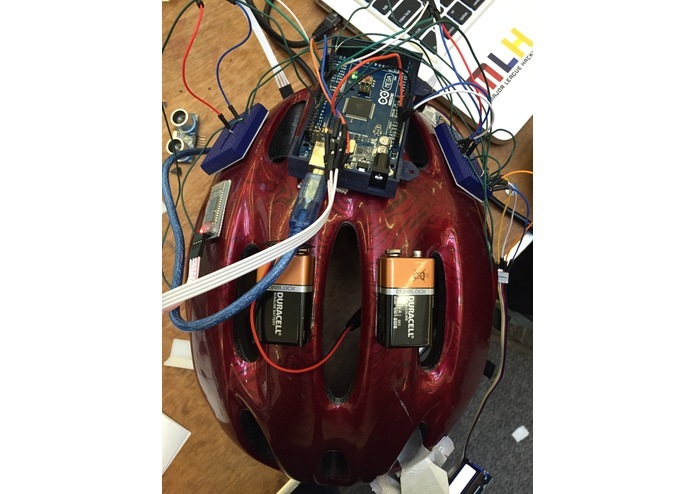 The Computer-Aided Design and 3D-printing came in a lot handy when we needed an adapter for the heads-up display to mount on the helmet. 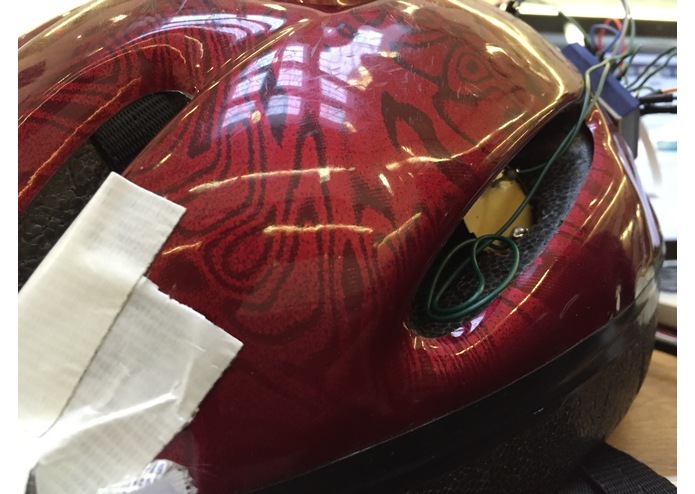 We took advantage of the technology also to drastically reduce the wear-and-tear and increase the reliability of the electronics system by printing an enclosure. Before we got the up-and-running device, we had a few major challenges. We were first trying to use Edison and Android Wear for all the above functions, but it took the first three hours until we realized we couldn’t set it up. So we decided it would be more efficient with the time yet a bit more challenging to build the device with the Arduino and manually to feed turn-by-turn navigation data to the LCD display with an Android app. 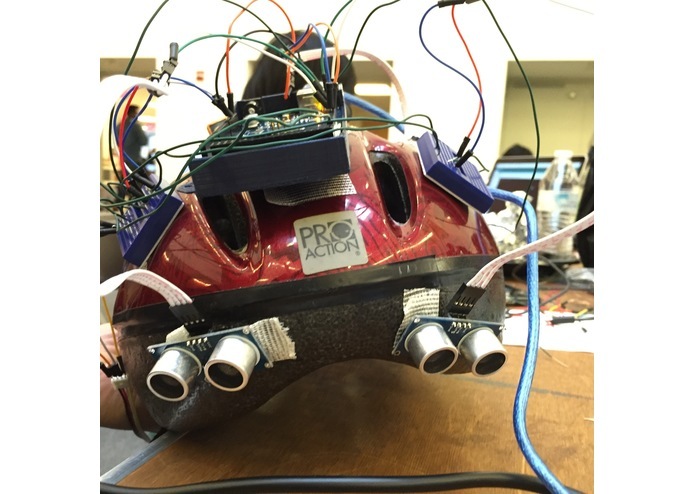 On the hardware aspect, one of the most challenging parts was designing the custom CAD model for the heads-up display due to initial time constraints with 3D printers. Since our goal with the device is to give maximum comfort in viewing the display without compromising the view of the biker, it took us a bit more time to draft the idea on paper and then on computer—and getting it right the first print. We didn’t know most of the things we have done for the hack. We learned all and applied knowledge to get them all up and running. Two of the prior experiences were building an Android app and wiring the system, which to our team members, were nothing new. One area that we believe can improve is alerting the biker in a challenging dynamic such as when the bikers have to turn his or her head to make quick decisions. We think that using an accelerometer to map the surrounding objects and actively interacting more with the mobile app and the Arduino Mega will be the solution to this challenge. In order to do so as well as analyze the data will require more data gathering in real-life situations. 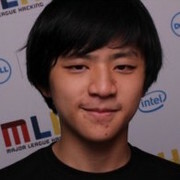 We would like to thank you for reading about our hack!